It's another summer weekend, and y'all know what that means... BARBECUES!!! Yeah baby, I love me some good ole' barbecues. You know the kind, the men all outside congregating around the grill complementing each other on their manliness (I'm just guessing this is what guys talk about while standing around the grill... lol!) and who can down a can of whatever drink is in their hands first, critiquing the griller's technique and hollering at the women to bring them more beverages. The kids are running around the yard being watched (hopefully!) by the men, or swimming and getting themselves very hungry for the food they will likely not want to stop to eat... And all the while the women are in the kitchen (cus we're really the smart ones being in AC) making up all the side dishes to go with the meat of choice being cooked by our men. Sound about right to you? ;-) Ok... I might have over-exaggerated a bit... But you get the point, a good barbecue is where we all come together to share a delicious meal. And I have just the thing for your next barbecue!! In a large bowl whisk together yogurt, marsmallow fluff and lemon juice until combined and smooth. 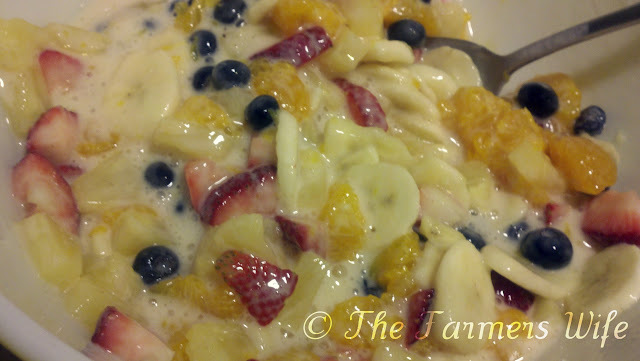 Add in your fruit and mix until fully coated. Refrigerate until ready to serve. This is incredibly simple, and sinfully delicious! This gets 5 stars from our family! If you wanted to you could add in some nuts for a crunch or a bit of granola, and you can really use any fruit you like as well. And be sure to stay tuned this week for more BBQ friendly sides all leading up to a VERY special Guest Post this Friday!! Yep. I have to agree. That sounds like the typical BBQ! The salad looks and sounds delicious...with so many different fruits in it! Can't wait to make it for my family...We're having a BBQ tonight! I think your right on the money with the whole BBQ thing! :) The fruit salad looks delish.....I love a good sweet sauce with my fruit. Yum! oh, this salad looks amazing! you gave me one great idea for today and for the party next week! thanks! This salad is so grand! Yes, it is just right for party! I am really saving this recipe! Thanks a lot for this unique salad recipe. I have been grilling so much lately too. Burgers, chicken, hot dogs... It's been so great! This fruit salad sounds delicious, and perfect for a light summer dessert. Marshmallow fluff in fruit salad?! YAAAAY! I love it! Marshmallow is perfect for a fruit salad-great idea. Yum! This sounds great! Marshmallow fluff is such a great idea for salad! What a great fruit salad....love that marshmallow fluff. I would dive right into this one. I love a loaded potato. Now I won't have to feel guilty eating your healthy twist on them!